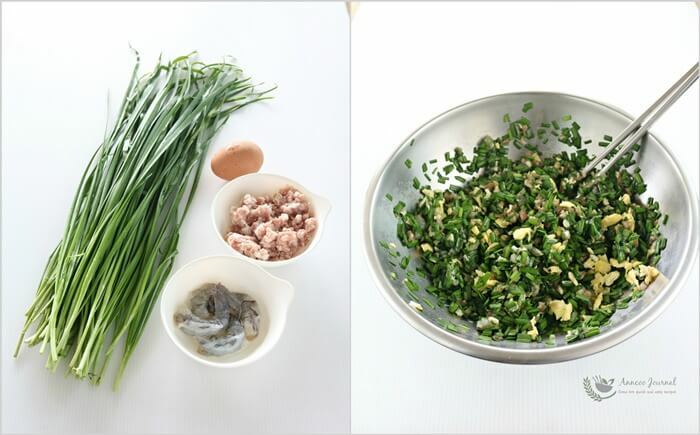 Chive pocket (literally chive box 韭菜盒子) is one of the most popular street snack food in Northern China besides Chinese pot stickers (jiaozhi 饺子). 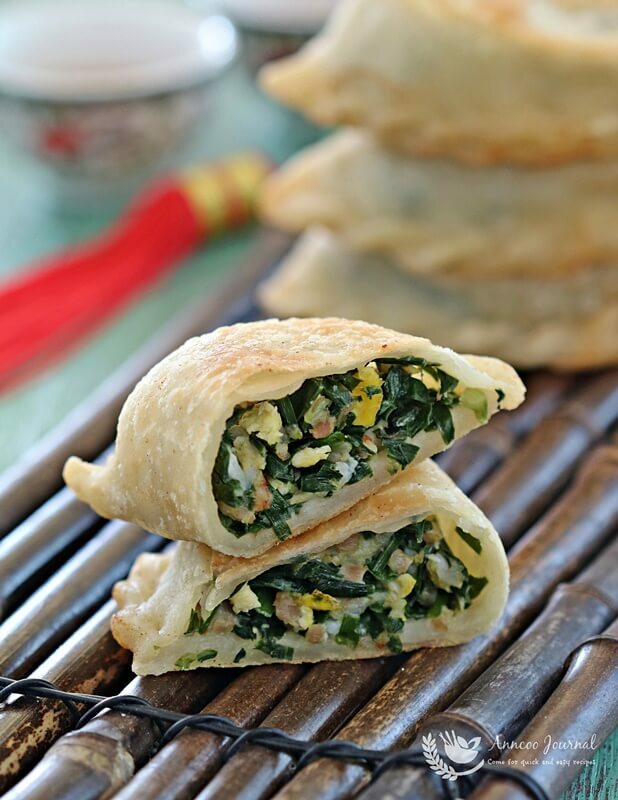 The ‘pockets’ are pan fried while very often the filling is a combination of chives and scrambled eggs which is also one of my favourite Chinese snacks but personally, I prefer to add some ground pork and prawns to the filling, so that it will not fall out easily and become messy, while eating. 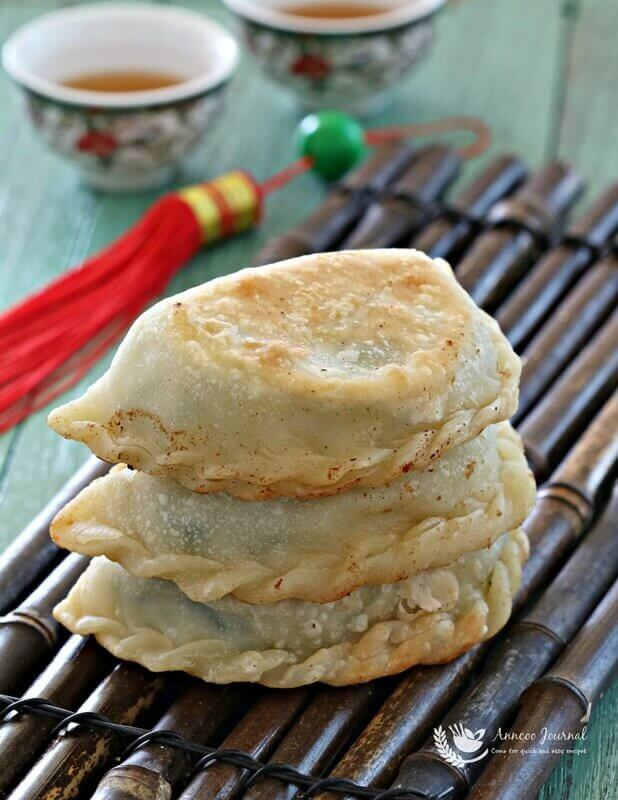 It is very easy to make this snack at home and can be served within an hour with a pot of brewed Chinese tea. Heat frying pan with oil and add beaten egg. Stir fry the beaten egg to break up to pieces, dish up and leave to cool. Filling - combine ground pork and prawn meat togeher. Add seasoning and mix well followed by chives and scrambled egg. Stir well again and chill chive mixture in the refrigerator for later use. 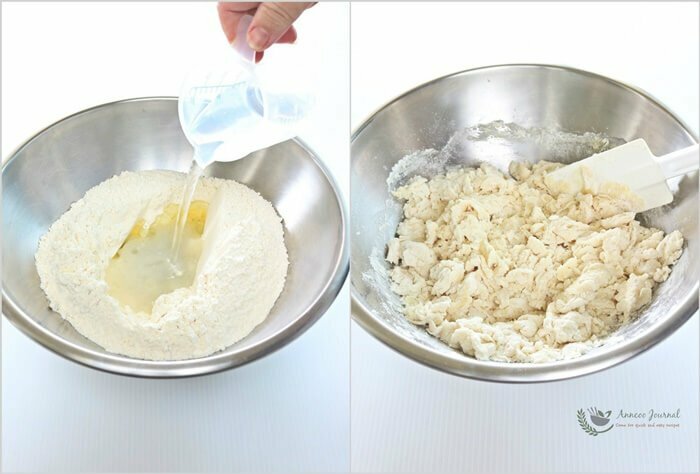 Dough skin - Sift plain flour and salt into a large bowl. Add corn oil and hot water into it. Using a pair of chopsticks or spatula and stir flour mixture to lumpy. Then pour in cold water (about 35ml) and use hand (dust with some flour) to knead flour mixture for about 5-7 minutes to smooth. 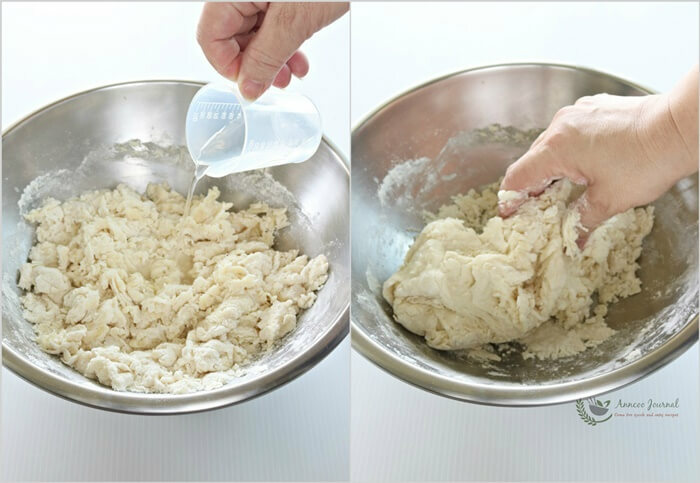 Add a little more water if dough skin is too dry or dust with little more flour if it is too sticky. 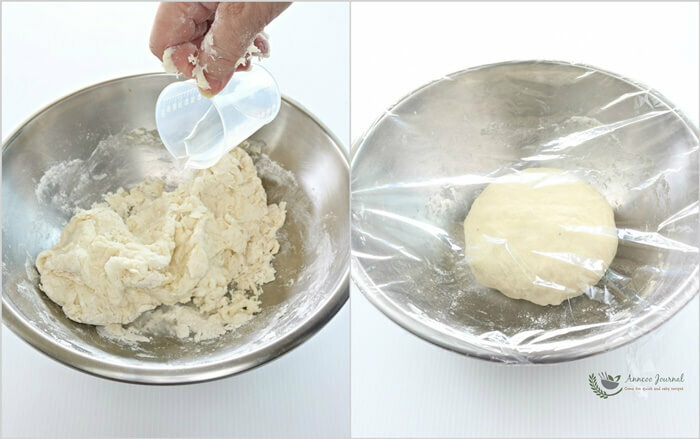 Cover with cling wrap and rest dough for 20 minutes. Dust some flour on work top, knead dough again and divide into 10 equal portions, about 45-50g each. 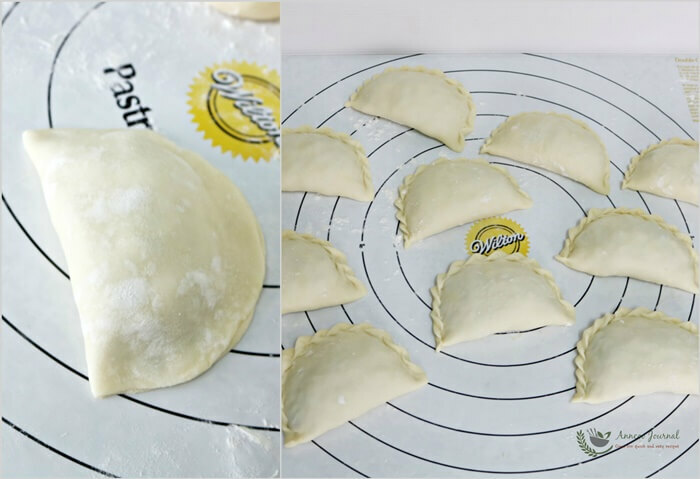 Roll soft dough into a smooth ball and flatten it on the work top. 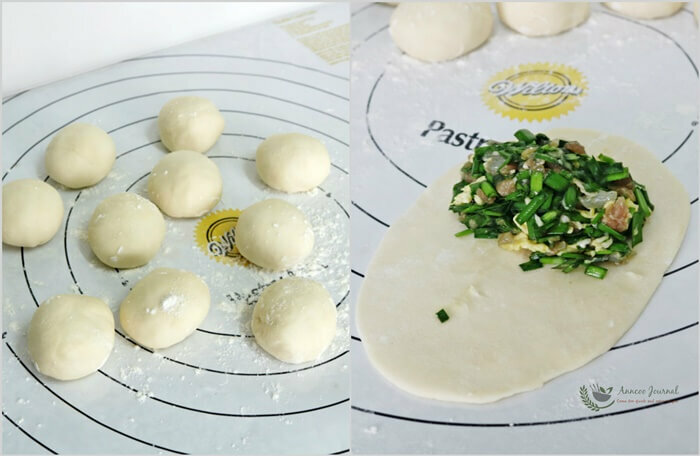 Then gently roll it with a rolling pin to a thin wrapper in an oval shape (as shown in pic). Scoop 2-3 tablespoons of chive filling on to one side of the wrap. fold it up and seal by pressing them together, then crimp the edges. 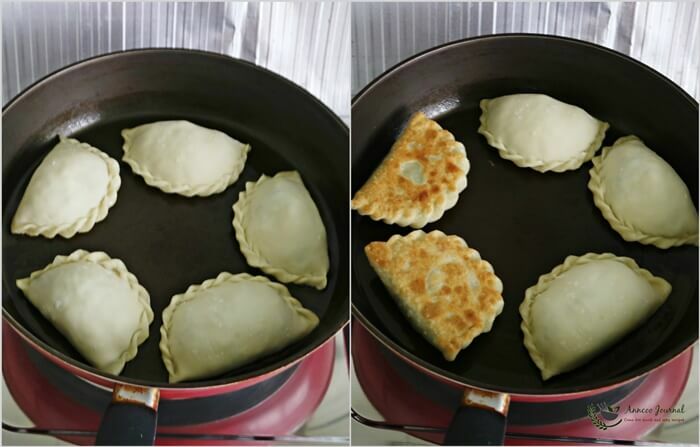 Add adequate oil in frying pan and pan fry the pockets both sides to golden brown, about 3-5 minutes on each side at medium low heat and it is now ready to serve. I made your chive pockets, it was so yummy! Substituted pork by chicken. Delicious, thank you for sharing! I’ve not eaten these Chive Pockets since ages… so tempting & delish! If i do not wish to pan fry so many, can I keep some in the freezer before pan fry ? Hi Angeline, Yes and pan fry straight from the freezer with little more oil. Do not thaw the chive pockets. Mouthwatering! Don’t see those Chinese chives over here..miss them terribly! Ann, I love chives, so these Chive Pockets are definitely something I would enjoy!